The production and revenue side of the PF budget is not impressive. It’s a gamble. (a)There is no guarantee that PF will raise the 27 trillion for its budget ambitions and (b) PF’s long-term plans for continued national productivity are unclear. Of course, PF’s huge allocations towards infrastructure, health and education are larger than MMD allocations; though some of the funds are allocated to wasteful expenditure. But let’s be fair. It is MMD who should be praised, not PF. PF is simply reaping and sharing where they did not sow by inheriting funds created by MMD.The Mwanawasa-Rupiah MMD was allocating less money on expenditure not because they were less caring, as PF wants to put it, but because they were building up a strong financial base. (It is the Sata-Chiluba MMD of 1991-2001 which had destroyed the economy). A man whose name is called PF kept condemning kumalomu while another man called MMD uprooted the trees, planted the seed and cultivated off the weeds. The children (Zambians) were hungry, but MMD told them that ‘my children let’s us sacrifice for we shall eat when the maize is ready’ through Magande’s HIPC. The moment maize got ready, the PF, using its advantage of a more numerous tribe, removes the MMD donkey worker and starts distribution the maize to the children. If the children (Zambians) are fair-minded and educated who will they praise? In Africa we are backward because instead of praising producers, we praise consumers who reap without sowing. We mock our farming people , the cattle keepers who wear mpato (tyre) shoes , as ba Mumbwa Mumbwa ba kaso (stingy villagers) and regard being the urban, unproductiveban’gwa’gwazi on the streets as kuchenjela. Yet, all economies that boomed like Industrial Revolution Europe in the 16th Century , Northern America in the 18th Century , as well as Brazil and the Asian Tigers ( Singapore, Thailand, China, Japan etc ) economically emerged by promoting servings (kaso)by individual entrepreneurs among its citizens and financing infrastructure while leaving consumerism take care of itself. The relief though, is that Finance Minister Alexander Chikwanda was decent enough to praise the MMD for leaving a vibrant economy with strong macro-economic indicators; 6.5 percent growth rate, 8.7 percent (October) Annual Inflation Rate, a K44, 802.1 billion share price index at the Lusaka Stock Exchange and a stable exchange rate arising from the resilient kwacha against major foreign currencies. Wasting 47 billion to unproductive black Zambians! The PF’s efforts to increase productivity through Zambian ‘producers’ is unlikely to be better than how MMD left it, at least not next year. Already fertilizer input distribution is worse than last years (I farm. I know), but Guy Scott and Agriculture Minister Emmanuel Chenda are blaming MMD! Then there is no clear emphasis to produce cheaper inputs like fertilizer and seed (so the export our maize competitively abroad), and there is not clear emphasis on the construction of new maize storage sheds (to stop maize waste). PF has allocated 47 billion for Citizen’s Empowerment. But just like in UNIP and MMD, this is largely going to waste. Why? Because the politicians themselves are not entrepreneurs. Without politics they go broke. So they hardly understand black Zambian investment mentality. Black Zambians need economic training to reach levels of Asian or European Zambian. Black Zambians are mostly, I mean mostly, very lazy, consumer-oriented, and dishonest and do their so called businesses without any research or planning at all.PF must ask MMD whether previous recipients of Citizen’s Empowerment funds or youth funds have been paid back! Black Zambians need to read Chibamba Kanyama’s master piece, ‘Business Values of our Time’! In order to deceive us that they have beaten their 90-day promise deadline, the PF government made a bare K400 fuel reduction average. But even those that celebrated this are now disillusioned because (a) no visible bus fare and goods prices went down and (b) PF reduced fuel by scraping off the levy which Oil Marketing Companies (OMC) charged us so that they keep a two week strategic fuel reserve. MMD had introduced this to prevent erratic fuel supplies. And according to PF Energy Minister Christopher Yaluma Government will now keep these reserves. But Government-run projects are normally more chaotic, while PF cadres that will be employed (PF mostly employs its cadres!) to run these reserves may use more of your taxes than OMC were charging you on the pump price. And what if the PF Government fails to keep these reserves? You will face fuel shortages again! Zambia needs 1.6 million liters of diesel per day. Government keeping a two week strategic reserve means it must keep 22.4 million liters of diesel at every given time in some reserve! Will the PF manage this? Then PF abolished the 40 percent upper corporate tax rate for banks (reduced to 35%). Again there is no guarantee that this will increase your ability to borrow from banks whom PF hopes will reduce their lending rates. Banks might use the increased liquidity to buy Government bonds which are more profitable to them. Besides, it’s the large scale established corporate entities that borrow capital from banks, not ordinary tuntembas. PF introduced a Tax Free income threshold of 2 million on formal workers. But this number is too small and the amounts which beneficiaries will save is too small (K200, 000 to K300, 000 each person) to save for investments. So really we should not expect much value-added to our economy from these experiments. The PF should not be judged by how much money they put in your pockets (consumption) but by how many productive ideas (science) they put in your heads and how many hoes (technology) they put in your hands. But can we expect too much from the PF? Their slogan was wrong in the first place. Instead of campaigning on ‘more tools in your hands’, they campaigned on the basis of ‘more money in your pockets’! We are attempting to put money into the pockets on people without science in their heads and without technology in their hands. They will ‘chew’ it! I would therefore advice banks to be very, very strict before lending money to black Zambians. They could fail to pay and we end up like the US where banks lost their operations capital. Prof Ali Mazrui said that the problem in Africa is that we consume what we don’t need (biscuits, coca cola, tea, fashion, deodorant spray etc) and produce what we don’t consume (cotton, copper, cobalt etc). Correct. But in Zambia we are worse. We produce nothing. Under Kaunda’s socialism which PF sometimes seems to want to re-introduce we failed to produce our copper and it is now produced by foreigners! If we are not careful the consumption-focused policies of the PF will leave our country broke again. History repeats itself. UNIP socialists inherited a vibrant economy. But with his 1969 economic reforms, Kaunda simply led his followers into the Copperbelt mines, and like a swarm of locusts that visited Chinua Achebe’s Umuofia village after every decade, we eat up all we inherited and went broke. Ba PF sure! MMD left you a fully grown ngombe (the mines) but you don’t know how to milk it? Tamwaishibawhat in Ila they call kukama mukupa ? To start with, mines will grow by investing in them , not by taxing them. PF budget concentrated on taxing them (consumerism) and their budget has no subheading like ‘Mining Development ‘trying to promote mining sustainability, expansion and prospecting for potential mining areas like Northern, Western and North-Western Provinces. Yet, even on merely how to collect revenue from existing mines, PF are totally confused. Are they neo-liberal capitalists? Are they state- aided welfare capitalists? Are they socialists? Are they communists? Since some of his ministers seem quite reasonable, it seems the person who is confusing things in the PF is President Sata himself. The man simply has no value position on anything. He is better off leaving day-to -day Government Administration to some one like Guy Scott, Given Lubinda or Alexander Chikwanda. During the UNIP era, he supported mines nationalization (socialism? ).This was so fantastic to him that he was initially bullying Kaunda’s Multiparty opponents so that Kaunda continues. Then, the same MMD last minute comer suddenly changed position. He loved Chiluba’s neo-liberal capitalism and corruption to the extent of axe-hacking those opposed to Chiluba’s third term bid. When President Mwanawasa imposed Windfall Taxi in 2008 (welfare capitalism) , Sata opposed it saying it will force the mines to close. When President Rupiah Banda abolished the Windfall Taxes in 2009, Sata changed position, now saying Windfall taxes was beneficial to Zambians. Even Bob Sichinga (while posing as a consultant but backing the PF) attacked Musokotwane for abolishing Windfall Taxes. But now when in office, instead of introducing windfall taxi, they increase royalty tax by 100% from 3% to 6%. During budget presentation Finance Minister Chikwanda said they were still consulting on Windfall Taxes. Then, Mines Minister Wilbur Simuusa said they were considering a 35% share take over (socialism?. Have we not nationalized the mines in 1972 and got 51% shareholding and they later closed down? )Now Finance Minister Chikwanda is saying the will not introduce Windfall Tax! So if a prospective mining company wants to come to invest in Zambia how can they plan without knowing the tax policy clearly? Even this raise of mineral loyalty to 6% was done without much preparation. The mine owners have not yet agreed to pay this tax. This is why Chamber of Mines Executive Officer Fred Bantubonse is saying Government must only put in the budget what has been agreed, not what they are yet to discuss! Let us not cheat ourselves that we have so much power over those mine owners. We don’t. Since we are weak at monitoring taxi compliance, mine owners can engage in massive taxi evasion or avoidance using methods we hardly understand. They can even resort to mining only high grade ore, and lay off workers who were extracting low grade ores. Or they may pay but cut off the workforce and overwork the few remaining ones. We as Zambians must start thinking things clearly if we are to avoid going round in circles. Capitalists can be powerful. Even Sata’s meeting the Chinese was a victory to the Chinese miners. He has fed and flattered them because he has realized how powerful they are. Any one wishing to get into politics must do their homework or stop it. It is no longer entertaining to be President anymore. Imposing mining taxes before agreeing with mine owners can be tricky. Look at what happened to the MMD. When the Mwanawasa administration introduced the Windfall Tax Amendment Act in 2008 following high copper prices on the world market two problems were pending. First mine owners claimed it was too much tax. Secondly when Windfall Tax was imposed and mine owners complained that the Government was breaking the Development Agreements (Stability Agreements) signed when they first came. There was even talk of suing our Government. Anyhow, Government proceeded and tried to adopt the tax regime form of Chile, the world’s largest copper producer. Mining companies in both Zambia and Chile invested on the basis of Stability Agreements which give mining companies certainty about taxes for a number of years. But in Chile the Agreements were out of negotiation, not imposed while in Zambia they were imposed, not agreed. Also in Chile, the kind of Windfall Tax is based on profits, not revenues. But this Zambian Windfall Tax was levied on revenues, which means it had no recognition of the costs of producing copper. It was three-tiered: a rate of 25% was to be applied when copper prices at the London Metal Exchange (LME) exceeds US$2.50 per Ib, 50% when the price exceeds US$3 per Ib and and 75% when the price exceeds US$3.50 per Ib . But some mine owners argued even then that their contribution to the economy even without windfall tax was quite a lot, especially that mine owners not only assist in social responsibility projects like housing constructions but that their workers also pay taxes. The Extractive Industries Taxation Initiative ( EITI) shows that some K2.2 trillion ( US$ 463 million ) was paid in taxes in 2008. First Quantum Minerals, owners of 80% of Kansanshi Mine, claim that since they began paying taxes in 2005, they will have paid K7.5 trillion (US$ 1.5 billion ) in taxes by end of this year. This figure is far much higher when you put in what other more efficient and low cost mines are contributing. Are the mines really being over-taxed on not? Government through —the EITI which they are signatories must give us accurate figures. 1. By justifying the Msazala MP joining PF and saying that money for bye election is there, Sata is supporting and/or behind (a) this resignation , (b) Japhen Mwakalombe’s to resignation as Chongwe MP because he appointed him into foreign service and (c) PF’s petitions of over opposition 70 seats whose subsequent bye elections could cost our taxes 1.2 trillion Kwacha. Zambians must mobilize heavily to remove this man from office in the next election before this country gets to bottom level rotting. As a compromise it’s even better to have another PF leader take over the PF and lead the next government. Sata has never been approved by any institution in his life. He won only because of having a larger tribe. No school ever certified his intellectual ability, the colonial police force dismissed him, Kaunda fired him as Governor, Chiluba removed his as minister (made him a useless portfolio minister) and refused to make him President. 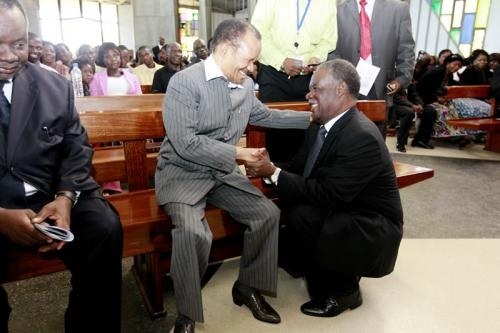 All former Presidents; Kaunda, Chiluba, Mwanawasa and Rupiah Banda stated that Sata was no presidential material. All the main newspapers siding with him now, had said the same before. All non-Bemba speaking regions, apart from Lusaka, rejected him. Mobilize people and stop whining about the man! Mr. Godfrey Mwamba, I don’t want accusations like those you said about ‘some opposition leaders’. I mean mobilizing people to VOTE against Sata legally. I repeat, CONSTITUTIONALLY. 2.MP Miles Sampa. Use that Parliament library. CSO data says Bemba speaking people (plus Namwanga group) are 39.8 % and Tonga speaking (Bantu Botatwe) people are 15.6%. We knew Don’t Kubeba means ‘I am ignorant so I wont tell what I don’t know’. Can’t you see these figures tally closely with results of last election? Thus Rupiah Administration felt not only that it would force the mine owners to close, but scare away prospective mining investors, which in turn would have led to no jobs at all and then more poverty ( Do you recall that President Ruphia Banda had to negotiate with mine owners to save worker’s jobs during the world economic recession? Could this be the negotiation that led to the withdrawal of Windfall Tax? )But former Finance Minister Ngandgu Magande insists that there was no need to remove Windfall Tax on grounds of that world recession because this tax was ‘self-adjusting’ ; once copper prices reduce on world market, the mechamism automatically make mine owners not to pay.Which is which? On 16th November 2011, World Bank Country Director Kundhavi Kadiresan advised the PF government against over dependence on Copper-generated taxes dues to uncertainty in the Euro zone and US economy! If the more ideologically stable MMD government faced problems, what more with the PF whose president is so unpredictable? So yes, lets us help the PF get mineral royalty they are trying to get, but let’s not get excited yet. Their policy is not yet stable. Otherwise, we may see the 27 trillion budget flop. Meanwhile, stop the PF from increasing its external borrowing if their revenue collection plans flop. It will result in a serious fiscal deficit again. Those following up on our old articles click buttons 1,2.3… on Editor’s Choice at end of this article.